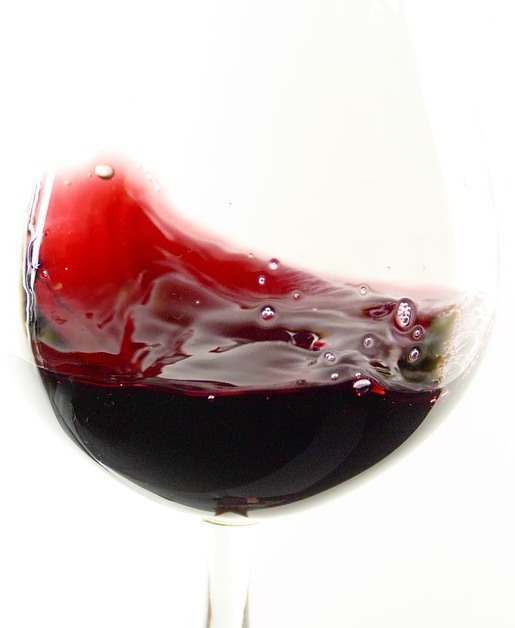 On hearing that you work in the wine trade, a very frequent question posed is what is the best wine you have consumed? For me the answer has always been the same, it is not just about the wine, but the wine and the occasion. My fondest wine memories have also been special moments in my life. 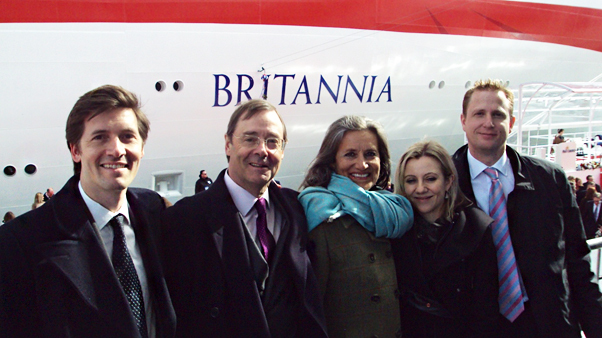 The launch of the new P&O ship Britannia on Tuesday 10th March was one such moment. 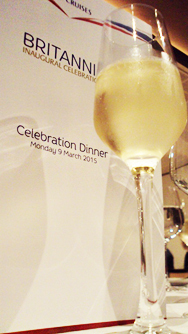 For us the 10th March represented a culmination of many different elements coming together. As Britannia represents the very best of British, it was fitting that she was named by a bottle of English sparkling wine and we were so proud that Wiston Estate from Findon in West Sussex was selected. We are so grateful to Olly Smith and the Carnival UK team for selecting Wiston against some very good competition. We are very proud and indeed fortunate to have been working with Wiston’s genius wine maker Dermot Sugrue and the Goring family from the outset. Our buyer Rebecca Palmer was the first in the trade to give a professional judgement. Suffice to say Wiston received a big thumbs up and the journey started. 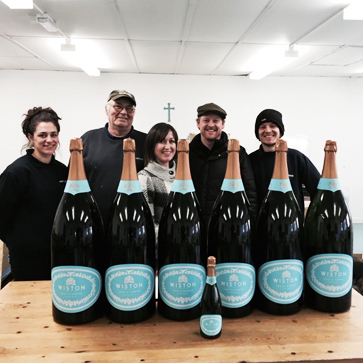 In the months leading up to the grand event, work was set about commissioning four Nebuchadnezzar’s for the naming ceremony, 15 litre bottles each containing at least 20 standard bottles worth, the largest sparkling format possible. Why so big you might ask? Given the immense size of Britannia and the size of her lettering on her bow, this is the perfect size. To bottle such a large format requires specialist equipment, so the empty Nebuchadnezzar’s and stock of Wiston was sent to France to be bottled. As these bottles are so big the traditional bottle secondary fermentation is less regular. So the contents of standard bottles are transferred to these larger formats under a pressurised process called transversage. At the same time the designers were working hard rescaling the new labels, as boy, did the labels need to be blown up in size! This was all a first for Wiston. Then the news broke about Her Majesty the Queen naming the ship. Wow. The pressure mounted. A week before the launch, the Wiston team ‘tailored’ the bottles by hand, carefully adding on the labels and neck foil – no mean feat I can assure you. I then arrived at the winery to load the 4 bottles into the boot of my car and I drove like Miss Daisy to their final resting cage at the Ocean Terminal in Southampton. I have to say it was one of the most nervous drives of my life, second only to the first time we drove our newborns home. Before we knew it the 9th of March had arrived and so had we to the Ocean terminal in Southampton. Wow what a sight. 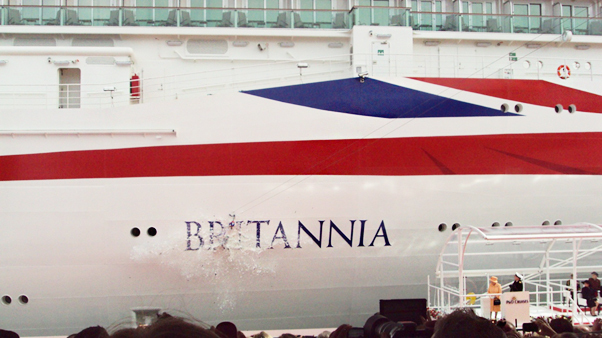 Britannia is the largest UK Cruise ship, measuring some 1,082 ft with some 15 decks a height of 232ft. Once checked in we made our way through the ship to our cabin. First stop off was to take in the hugely impressive atrium, undoubtedly the heart of the ship. The designers have done an outstanding job and created a ship with an absolutely unique feel. We couldn’t help but notice the amazing array of cakes by Eric Lanlard and these had to be washed down with an elegant glass of Wiston with the Wiston team consisting of Pip, Harry and Rick Goring and wine maker Dermot Sugrue. We were then joined by our buyer Rebecca Palmer. This very much was the life. After a quick walk around the ship and stop off in the Crow’s Nest to sample the new exclusive wines we had blended with Olly Smith, we slipped into our black tie for the Gala evening. Rob Brydon provided an excellent start to the evening and his mention of Wiston met with big beaming smiles from Rick Goring and Dermot Sugrue. We then proceeded to dinner to sample dishes prepared by each of P&O Food Hero’s including Marco Pierre White, James Martin, Atul Kochlar, Eric Lanlard, Olly Smith and Charlie Turnball. 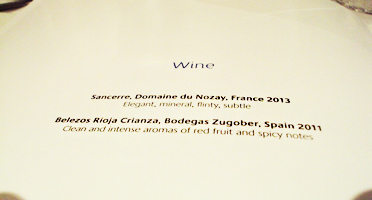 These were all washed down with Corney & Barrow’s own Sancerre, Domaine du Nozay and our Rioja Crianza from Belezos Zugober. It was an amazing evening, with each dish brilliantly prepared and how the chefs on board prepared such quality on this scale, I have no idea. The evening was rounded off with fireworks and a quick trip to Olly Smiths Glasshouse wine bar to sample some of the delights on board such as Eradus Sauvignon Blanc, Delamotte, Mad Dog Shiraz and Achaval Ferrer Malbec. After a good night’s sleep on board and a full P&O English breakfast we were well placed for the day. Not too long after we were installed in the grandstand alongside Britannia, with the Nebuchadnezzar of Wiston sitting high above us at the top of the zip wire awaiting its grand arrival. One thing I should mention is that the P&O events team had thought of everything and the event could not have been better organised. Indeed, we were each handed with a goody bag equipped with hand warmers and hot drink. The stage was set. The excitement mounted and the entertainment was as spectacular as the ship. Rob Brydon did a great job and spirits were high. I have to mention the Hot Red Chilli Pipers who provided a musical masterpiece which set the adrenaline running even faster. Then we were set. Her Majesty the Queen was invited to take to the stage and names the ship and on pressing the launch button, the Nebuchadnezzar of Wiston made its way to the side of the ship. Their meeting was impressive with a wonderful exposition and absolutely no doubt that the bottle had failed to break. There was plenty of emotion, especially from the Wiston team. To them this was so much more than just a naming ceremony. A vision of Pip Goring over 30 years ago, a vision which many said would never happen, was now not just a reality, but one which the Queen herself had presided over. As wine maker Dermot Sugrue said himself, not a single drop of that wine had been wasted as it was such a special moment which meant so much. There was not a dry eye in the Wiston camp, a testament to how much this meant to them. The Queen then made her way on board to greet the crew and enjoy a special lunch. We were then able to enjoy a great lunch on board before heading back home to take all of this in. So when I am next asked about my greatest wine moment, I shall have a new reply.